So I've been using 1Password for a long time as a single license user, but just today I signed up for a 1Password Family account after thinking about it for a long time. One of the main motivations is to be able to share passwords with other family members more easily and securely. So how I thought this would work, based on the nice emails in previous months from the newsletter, is that I could share individual items from my own private vault with anyone in the family. But it seems the sharing is actually only done by copying or moving items from my private vault to the/a shared one. So how does this work exactly? What I wanted was a way to share items read-only, and if I ever update the item everyone always has the latest value. If I copy the item to the vault then it doesn't stay in sync with the original, so that doesn't seem to work too well. If I change something then the copied one is now inaccurate. If I move the item to the shared vault then now every family member is able to modify it I'm guessing? That isn't what I want either, I just want them to be able to use the information. The other problem with moving items is that it makes it harder to share things temporarily with family members. If I want to share a login temporarily then I was imagining I could just right click on the item and choose "share with family". Once that's done I could right click on it again later and choose "unshare with family". Instead it looks like I have to keep moving items back and forth between vaults... unless there is something I'm missing? I think basically what I was expecting is that the shared vault would be a read-only vault that always showed the data from the original items, and I wouldn't have to manage which items belong to which vault just to share them. Welcome to the forum, @mysticflute! I'm sorry for the confusion. If I copy the item to the vault then it doesn't stay in sync with the original, so that doesn't seem to work too well. Right. Copying the item creates a brand-new copy, which is separate from the original item in every way. Deleting/changing one will not affect the other, as they do not sync. What I wanted was a way to share items read-only, and if I ever update the item everyone always has the latest value. Make all family members (or whatever configuration you wish) access to this vault. Place items you wish to "broadcast" (i.e. - have people use but not edit) in this vault. Place items you're OK with people editing/deleting/adding to in the Shared vault. I hope that meets your needs; 1Password is a vault-based system, but there is a good deal of flexibility within it. Let us know if you have any further questions. @mysticflute - yeah, there's definitely a bit of a perspective adjustment, if you're used to standalone mode. You have the advantage over a completely new user of knowing your way around the 1Password UI and some of our conventions, but they would have the advantage of not having well-worn mental grooves about how things are "supposed" to work. You'll get there...and when you do, you'll wonder how you ever did it any other way. At least, that was our individual experiences here. I too want to share items with my wife that she can only view, and I just want to place them in her vault. It's going to be a problem if she has to switch between her vault and another vault. So is there a way for me to have one, say credit card, that's in my vault, I shared it with her in her vault, and she cannot edit the info? If not, then I ask that this functionality be added to 1P families. There is no need for her to switch between vaults to accomplish this, but it does require a separate vault. 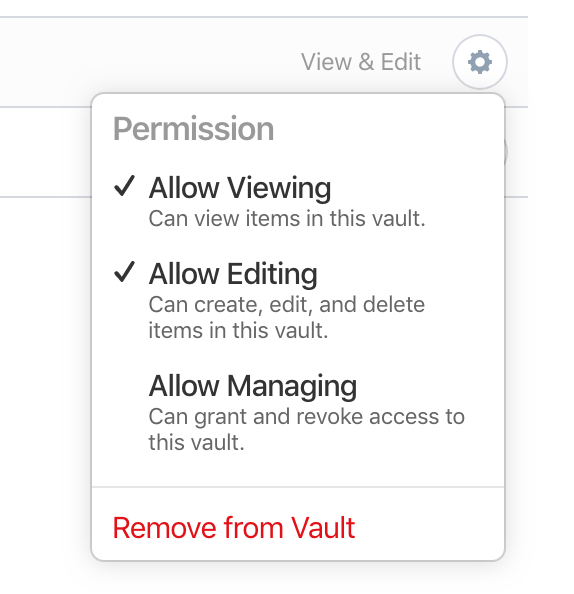 The lowest level permissions happen at is the vault level -- there is no way to define permissions for a specific item. The reason vault switching is not required is that 1Password has an All Vaults view, which is the default. Item level permissions would add a significant level of complexity and require a significant amount of development and design work. That isn't to say we wouldn't consider doing it, but the demand would have to be an order of magnitude higher for this than it is now. Hopefully the above will work for you in the mean time. Thanks Ben. Ironically, I was just thinking that could be a solution. Thanks. I will do it that way, and I think it will work fine. 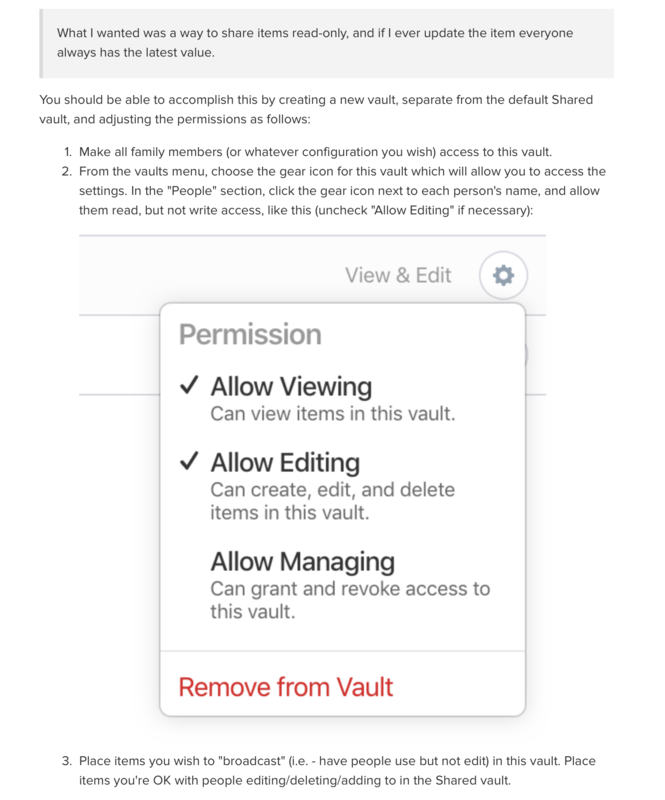 Where is this permissions setting in the Mac app? I think I have to do this in a browser if I recall. Checking that now... Yep, confirmed! Correct. Account management is done through the 1Password.com web interface. But it sounds like you got that sorted. The cool thing about sharing vaults instead of individual items is that you only need to set it up once, and then it's just a matter of saving an item to that vault any time you want to share something else. Cheers!